Sometimes I like to think that I am quite innovative. My childhood is recorded in notebooks outlining plans of creating an assembly line producing chocolate syrup and jelly snowballs (much more effective for the guerrilla snowball attack I would launch from my underground fort), in egg cartons filled with potion making supplies such as “newt eyes” and “unicorn horns”, in the tissue box and paper towel tube mansions created for my hamster. Heck, I made one of those pinhole eclipse watchers to look at the transit of Venus last week and I was pretty pleased with myself. You've already heard about my love for Christina Tosi. But I can't get over her innovation. She has such a unique way of playing with flavor and presenting her desserts. 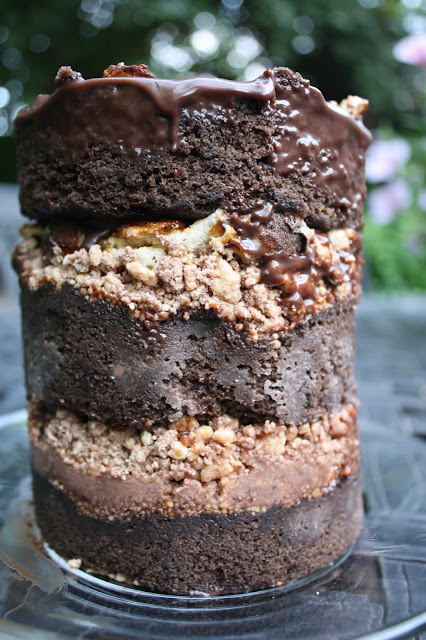 I don't think I've ever seen a cake with exposed layers like hers. And I wanted to replicate one. Problem is....I didn't have a 6 inch cake ring. Or acetate strips. Sigh. Roadblocks. I do believe that as you get older you learn to improvise more, roll with the punches. So I worked with what I had. I thought my four inch cake pans would be a cute size, so I cut my layers using that. I built my own ring out of aluminum foil. And instead of acetate strips to build the cake up, I used those clear, report covers. Worked fine. This is definitely a multi-day cake, but it's delicious and fun to make. Well worth the effort. Like I did with the 8 texture tiramisu, I'll outline the order you should probably do things. Also, read all the instructions before attempting so you know what's going on. Give it a go! Heat oven to 250F. Combine milk powder, flour, cornstarch, sugar and salt. Toss with your hands. Add melted butter and toss until it comes together into crumbs. Spread the clusters on a silpat or parchment lined sheet and bake for 20 minutes. When cooled, toss the crumbs with malt powder until they're covered. Pour white chocolate over crumbs until the clustered are covered. Crumbs will keep in the fridge in an airtight container or in the freezer for a month. Place first 4 ingredients in medium bowl; set aside. Combine cream, corn syrup, and sugar in heavy medium saucepan. Bring to boil, stirring until sugar dissolves. Pour cream mixture over chocolate mixture in bowl. Let stand 1 minute, then stir until smooth. Whisk until sauce is glossy, about 1 minute. Can be kept in the fridge up to one week. Place first 4 ingredients in medium bowl; set aside. Combine cream, corn syrup, and sugar in heavy medium saucepan. Bring to boil, stirring until sugar dissolves. Pour cream mixture over chocolate mixture in bowl. Let stand 1 minute, then stir until smooth. Whisk until sauce is glossy, about 1 minute.Can be kept in the fridge up to one week. Heat oven to 350F. Combine butter and sugar in a stand mixer with the paddle attachment and cream for 2-3 minutes. Scrape down the bowl, add eggs and vanilla, and mix on medium high for 2-3 minutes. On low speed, add buttermilk and oil. Increase the mixer to medium high for 3-5 minutes until the mixture is very pale and fluffy. Add the fudge sauce and mix until fully incorporated. Stir in flour, cocoa, and baking powder and mix until it comes together. Spray a quarter sheet pan and line it with parchment. Spread the cake batter in the pan and bake for 30-35 minutes. Cool on a wire rack. Cake can be stored tightly wrapped in plastic for up to 5 days. Spread 2 3/4 cups mini marshmallows on an unlined sheet pan and char them with a blowtorch or under the broiler. Don't be afraid. Transfer to the fridge or freezer for 10 minutes then use immediately. Clean the cake ring and place it on a silpat lined sheet pan. Use a strip of acetate to line the inside of the cake ring. 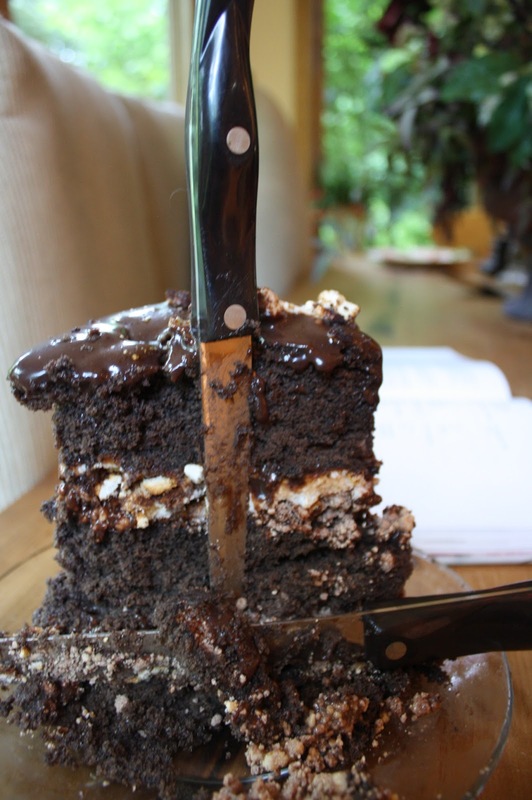 Stamp out three 4 inch rounds from your sheet cake (or two 6 inch rounds, gather up the scraps) and place one round in the ring, or tamp down your scraps into the bottom layer. Spread half the chocolate malt soak into the cake. Spread 1/5 of the warm malt sauce on the layer, then half of the malt crumbs and 1/3 of the charred marshmallows. Spread another 1/5 of the malt sauce over the marshmallows. Gently tuck another strip of acetate between the cake ring and the top strip of acetate so there's a cake ring 5-6 inches tall. Set a cake round on top of the first layer and repeat the process for layer 1. Nestle the remaining cake layer on the top of the malt sauce. Cover the top of the cake with the remaining sauce and marshmallows. Freeze the cake for 12 hours or up to 2 weeks. At least three hours before serving the cake, pull out the sheet pan and gently pop the cake out of the ring and remove the acetate. Transfer to a plate and let it defrost in the fridge before eating. Nice job, you've finished! Now devour your work. All praises of Odin be upon you! I can't feel my legs. Only way that would look any better is if you put a unicorn horn right on the top, oooohohohoh. Oh my how good this looks.....nice and chocolatey...and charred marshmallows, yummy. I almost feel the pounds on the hips just looking at it...LOL! My goodness that looks like a little bit of heaven. I think it's a big bit of heaven!